Do you like carrots ? That's good because it's your turn and there are a lot of carrots to eat in Karrotz ! 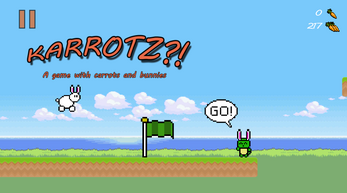 Be a starving bunny in a crazy endless runner ! Eat, jump, survive, with the cheers of your #1 fan turtle and use all your skills or the poor bunny gonna be cooked ! Share your score on twitter and see who is the Carrot King ! Featuring : speed, achievements, and carrots !